To paraphrase P. T. Barnum, “there’s a Bluetooth speaker born every minute.” At no time of year is that more true than at CES in Las Vegas, where they are bountiful beyond belief. But very few — nay, only one that I found — are made of concrete. And it’s French! And why not concrete? It’s hard-wearing, cool-looking, tactile — and, like ceramic, actually has good qualities as far as using it for audio purposes. Or so the honest folks at Le Pavé Parisien tell me. The speaker itself is single-channel, meaning it will mix down your music to mono (like many such speakers), but you can easily daisy chain a couple together for stereo or wire a bunch for a concrete wall of sound like they had on display. I won’t speculate on the audio quality (it was extremely loud in the hall), but they’re marketing it as a high-end device, so it’s probably not bad. Although 60-20,000 Hz means you’ll miss out on the low end somewhat, that’s kind of expected with small speakers. 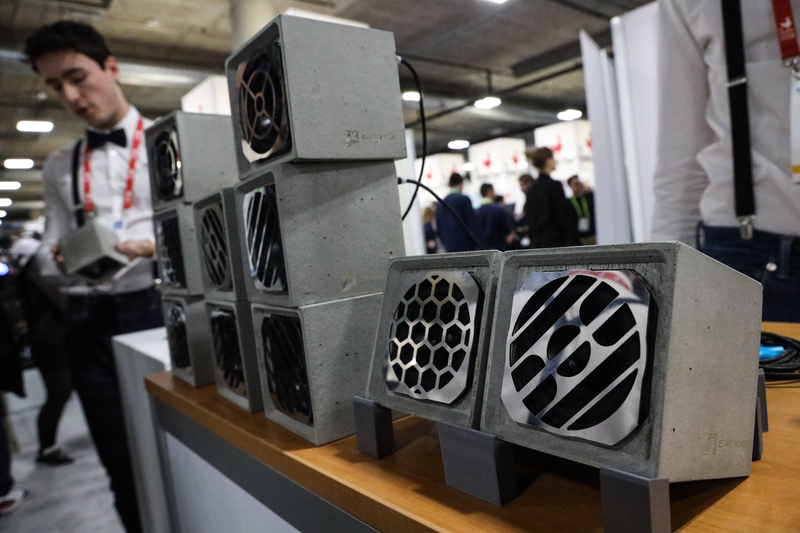 One of the company’s engineers, Aurelien Bertini, explained that concrete is actually also more eco-friendly, as it can be recycled by being pounded into dust and recast. Sounds labor-intensive, but that’s how recycling is. Bertini noted that concrete also can easily be customized — laser etched, dyed, etc. The magnetic grilles on the front are easily swapped out as well. They’re really not as heavy as they look, either: about 3 pounds. It’s mostly air in there. More importantly, the device is designed to be repaired; you pop the grille off and there are only four screws holding the guts in; take it out, replace a piece, fit something back in place that fell off, that sort of thing. You’ll want to repair yours, too, since Le Pavé Parisien is currently selling for $400, rather higher than the average Bluetooth speaker. If you simply must have them, they’re on sale now (following a successful recent crowdfunding campaign) and expected to ship next month.